Goa is the most sought after holiday destination in India and it was on my bucket list for a long time.After umpteen deliberations about the dates we finally set out for a get away to Goa.We went there in the month of August, when the rains were ebbing and you get relatively less crowds . October to March is the peak tourist season in Goa. We flew down to Goa from New Delhi by Indigo Airlines (cause it’s the cheapest ) and reached in just two and half hours.Our hotel had offered free pick and drop from the airport and the moment we touched the Goa airport, I received a call from the taxi driver informing me that he was waiting for us outside the airport and also gave us the details of the vehicle .Within fifteen minutes ,we reached our hotel – Joet’s Guest House on Bogmolo Beach,Goa . At first glance we were quite disappointed by our hotel room .It seemed so tiny and the website description had said that it was close to the beach but on looking out of the window I saw no beach (of course it was past midnight anyways and pitch dark too).We slept very well that night but not before gorging on the chips and chocolates and the Coke cans in the mini bar. The next morning, I woke up early, as is my habit, and stepped out into the balcony to have a look around and get some fresh morning air. 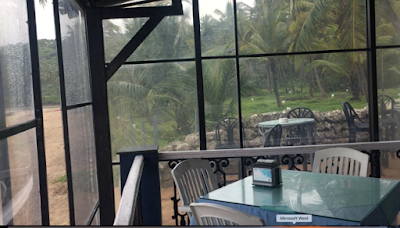 I was taken aback by the view – lush green coconut trees and a blue sky greeted me .There was the swirling sea and waves crashing onto the beach (the waves are higher in the morning and late evening because of the tides). I shouted with joy and woke up my companions to witness the glorious sight.They were as taken in as I was with the mesmerizing sights of the sea and we quickly went down to the beach which was just a few steps away and spent almost the entire morning taking in the sea breeze and feeling the warm sea water and sand under our feet . 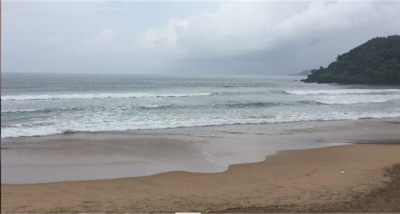 The beach near our Guest house was not at all crowded and we enjoyed the tranquility of the breach save for the roar of the surfing waves. Time just flew as we lazed and frolicked on the beach and it was only when our stomachs started grumbling that we realized that we were famished. 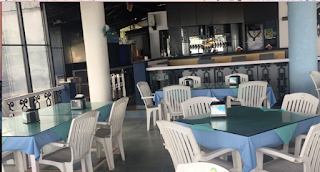 We then proceeded to a lazy brunch in Joet’s restaurant which overlooked the beach.Joet's also has live music and Karaoke nights on Friday and Saturday which draws big crowds especially foreigners. We had a hearty English Breakfast of Buttered Toast, marmalade, boiled eggs and coffee/tea/Fruit juice. 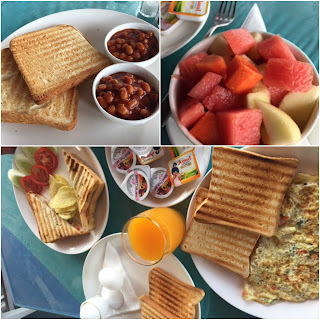 Refreshed and fortified, we then chalked out the itinerary for the day and it was decided that we shall visit churches in the vicinity . We booked a taxi (taxis are very expensive in Goa so if you can rent a car or bike then you can save a lot of money ) for visiting The Bom Jesus Church . The taxi ride itself was fun with the driver offering a lot of insights into the local living , local issues and the history. We witnessed the charming Portuguese houses , women selling " Zoya " flowers for worship and greenery all around . 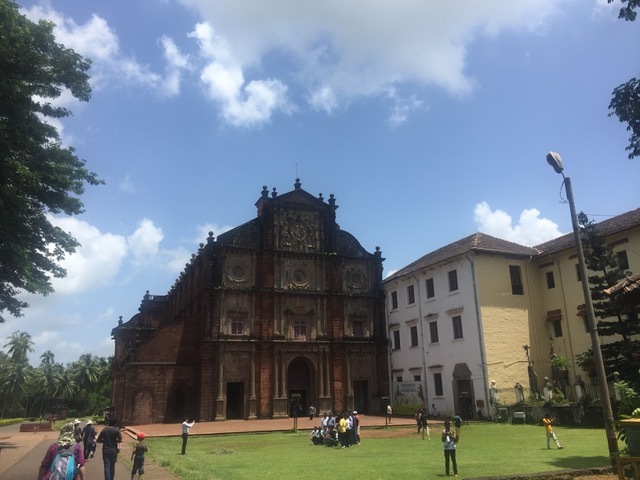 The famous Basilica of Bom Jesus Church of Old Goa , is one of the oldest and most famous churches of Goa . Located at Old Goa, 10 kilometres east of Panaji, the Bom Jesus Basilica is a World Heritage Monument. 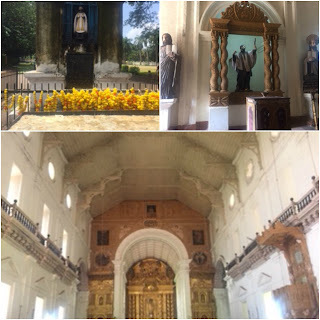 The church is called "Bom Jesus" meaning 'good Jesus' or 'infant Jesus' to whom it is dedicated. The foundation stone of this remarkably large church was laid on 24 November 1594 and construction was completed in 1605. On the southern side in the transept ( the area in a church that lies across the main body of the edifice) is a chapel with gilded twisted columns and floral decorations of wood,where the sacred relics of the body of St. Francis Xavier are kept. The interior of this chapel is richly adorned with wooden carvings and paintings, depicting the scenes from the life and times of St. Francis which make for very interesting viewing. St. Francis Xavier was born in a powerful family in Navarra (Now Spain),the Young Francis met Ignatius in Paris and his life took a turn , he devoted his entire life to serving others and spreading the name of Christ wherever he went .He reached Goa on 6th of May, 1542- after a painful journey of 13 months and Goa became the base of his operations for the next ten years of his life . St. Francis Xavier died in Sancian, near China, in 1552. 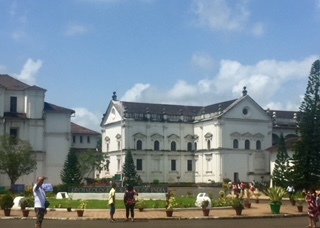 The legend goes that even after 76 days of death,when the body of St.Francis was exhumed, it was found fresh and without any signs of decay despite being buried without embalming.He was then canonised and his body or rather the relics after being transferred from one place to another finally rest at the Bom Jesus Church . There's a modern art gallery attached to the Basilica and after an Entry Fee of INR 5/- only, we got to admire the Paintings by Don Martin, Photographs by Benoy K. Behl and Sketches by Sunita Dalvi. The sketches impressed me a lot. 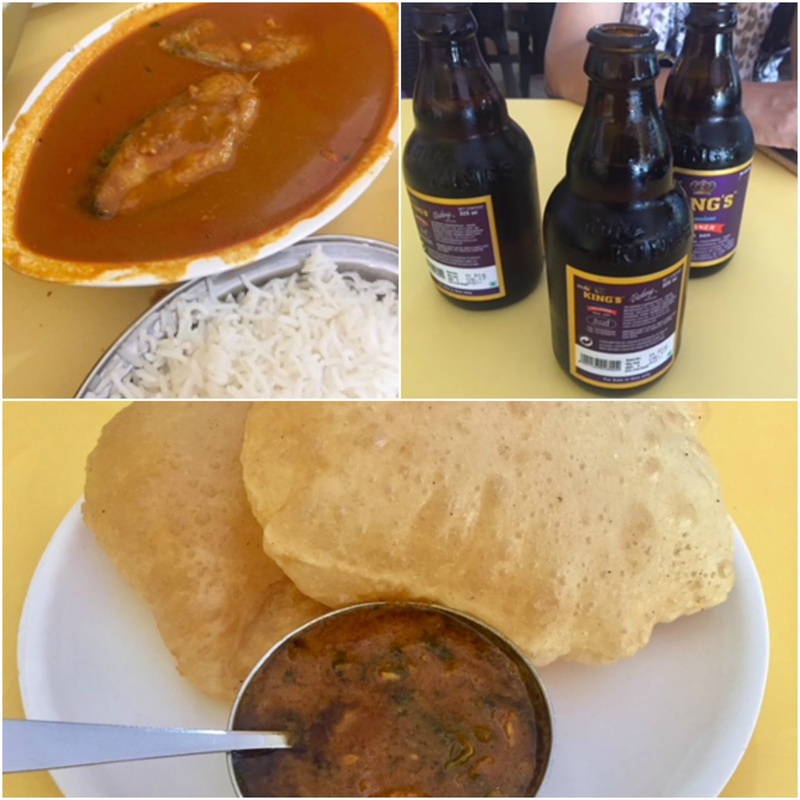 After seeing the Bom Jesus Basilica ,we were tired and settled down for lunch ( on the recommendation of our guide ) at a popular local eatery "Ratna Sagar " which was a multi cuisine restaurant where we had The Goan style Fish Curry and Poori Bhaji Goan style with the local Goan beer - Kings' Beer . 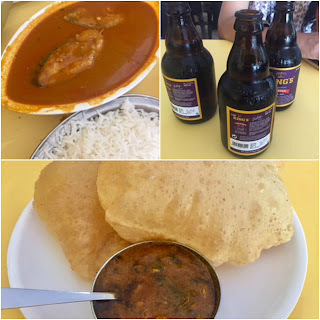 This Beer was quite good , it is very inexpensive too and liquor is freely available at all restaurants and shops.Public drinking is allowed and surprisingly I did not see any brawls or rash driving despite the freely flowing liquor in Goa ! On our way back to the hotel ,we stopped at Abyss Marine Fish Aquarium - a small place but it had some very interesting varieties of fishes like Lion Fish , Starfishes etc.on display. 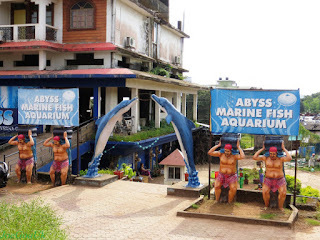 This is a place that will interest both adults and kids greatly.The entry charge was Rs 100/- per head and you could see the whole place in 15 mins as it is a small aquarium. Alert - The place smells ( what else but fishy !) and is not very spacious -in fact it was rather eerie to me with its dark ,congested interiors and dimly lit aquariums full of strange and large sea lives. FOOD IN GOA - Being a coastal state , Goa is a sea food lover's paradise so do try out all sorts of fishes (they even serve shark ) like sukka ,bangda ,Kingfish ,Prawns,Crabs , Mussels, Squids etc when you are here. The cuisine uses raw coconut ,Curry leaves,fennel,coriander, kokum and vinegar quite liberally . The Catholic and Portuguese influence also has its presence in the food through Vindaloo, Xacuti,Sorpotel ,Rachedo and Balchao dishes , Roast beef pork sausages and also the famous Bebinca dessert . 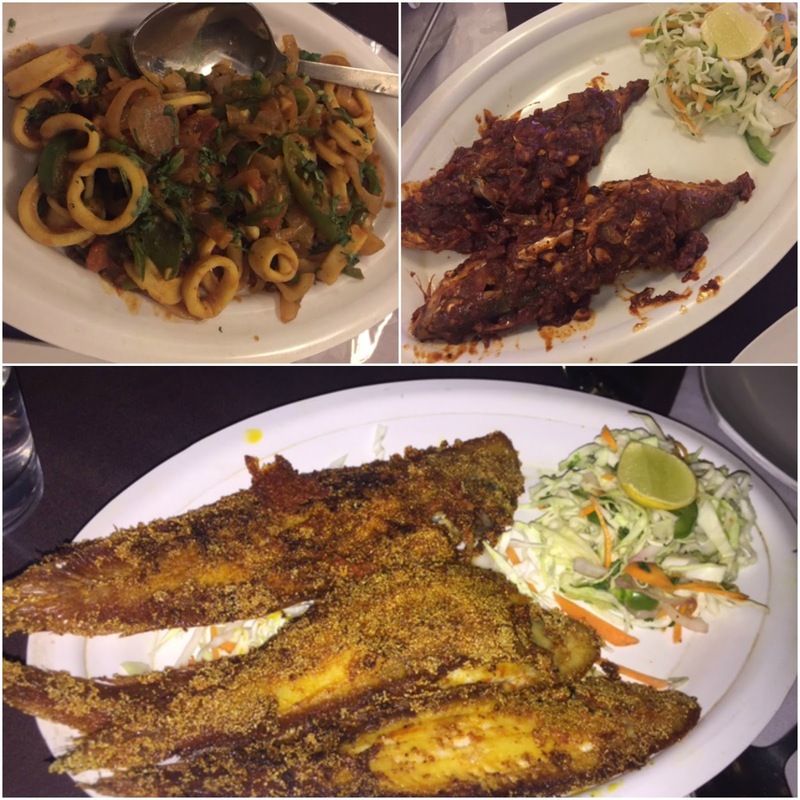 The Maharashtrian and Hindu influence on Goan food is also seen in the Bhaji ,Varan ,Kokum sherbat , Solachi Kadhi and laddoos and halwas . Do not miss the locally made Goan country liquer - The Feni - though it is quite potent I must warn. Also Goa is famous for its Cashews -from whole to roasted,spiced etc . which make for good gifting option . After that we went to the SE Cathedral which is dedicated to St. Catherine of Alexandria . 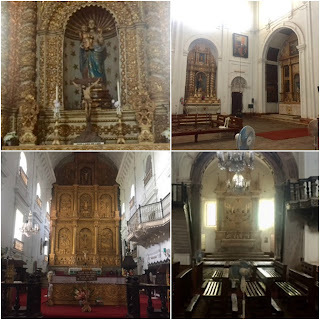 This is one of the most ancient and celebrated religious buildings of Goa, a reminder of to the Roman Catholic rule in Goa under the Portuguese.SE Cathedral is the largest church in Asia.It had some breathtaking indoors . Word of caution – you are supposed to dress conservatively ,so while jeans and skirts are allowed , one is supposed to cover the bare shoulders while entering the premises..Do carry a stole to cover up . 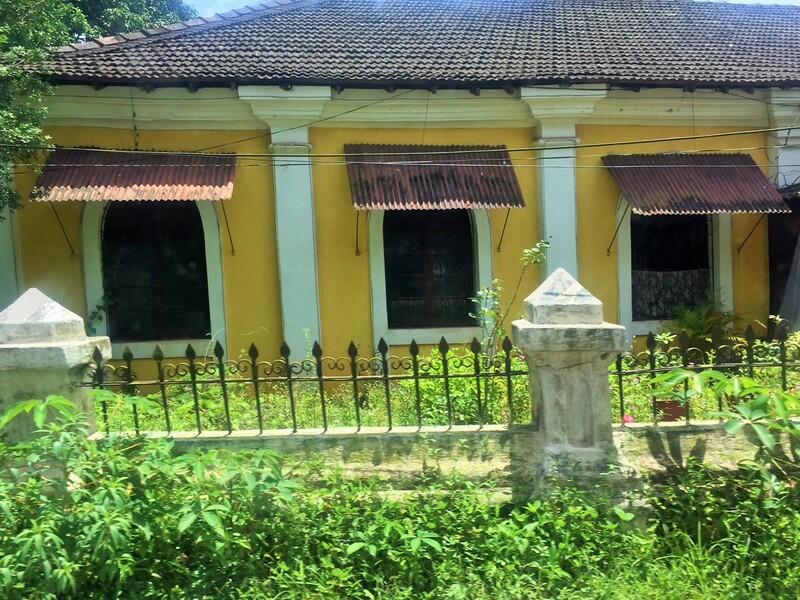 The museum has been functioning since 1964 in the abandoned convent of St. Francis of Assisi and is maintained by the Archaeological Survey of India (ASI). The collection here consists of some Brahmanical sculptures hero-stones ( stones erected in the memory of brave men slain in battle or met an unnatural death and were worshipped as heros ) and Sati stones ( Sati was the practice in ancient India where a widow chose or was forced to burn herself in the funeral pyre of her husband like Lord Shiva's consort Sati did ,after the death of her Husband .These women were then called Sati Mata and were worshipped ). The museum also houses portraits, coins and currency, revenue and court fee stamps, wooden and bronze sculptures and arms from the medieval period . It is a very popular tourist spot in Goa. It is here that two of Goa's rivers – River Mandovi and River Zuari meet the Arabian Sea and the place offers a very fine view of the Marmagao Harbour. Named after Dona Paula de Menezes, this place is called the Lovers Paradise due to a popular myth that has been attached to this place. According one legend the Viceroy's daughter after facing objections from her family about her love affair with a poor fisherman jumped off the cliff here.The locals shared some interesting stories about Dona Paula with the most hair raising being being that on Moonless nights, the ghost of Dona Paula rises from the sea and roams the area,wearing a string of pearls and nothing else! Myths and folklore not withstanding , this place looks beautiful and tranquil at night and has a romance to it on moonlit nights .Visit it only after sunset to feel the charm , the area has some great casinos and cruises which you can try before going to the bay. 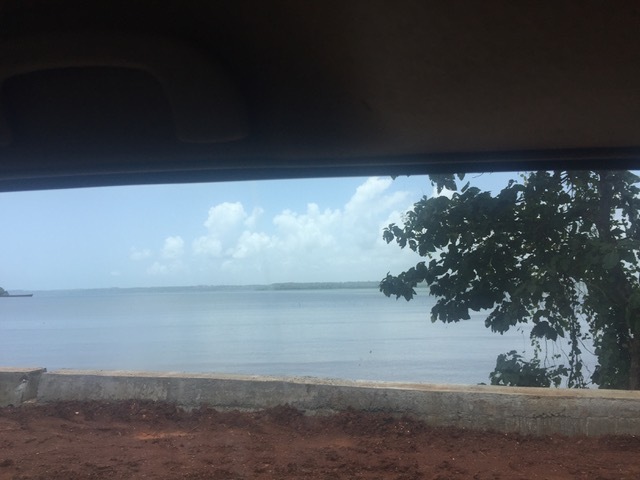 CRUISES – When in Goa , you have to experience a cruise on the river Mandovi . There are plenty of options depending on the time on your hands and the money in your pockets from overnight cruises , daytime boat cruises, sunset boat cruises to moonlight boat cruises even special Honeymoon packages for love birds ! During the cruise professional dance troupes entertain and even perform the local dance forms of Goa like Dekni Temple Dance, the Fugdi Dance and the Corredinho Dance. Casino Cruises are also available but the prices are on the higher side . 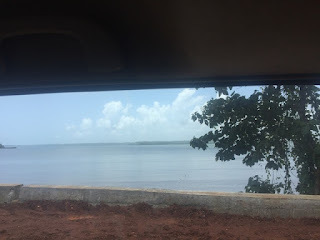 We tried a one hour short cruise on the river Mandovi since we were very short on time .During that one hour we were entertained with dance performances by local performers. Beer and snacks were available on the deck at extra cost. The dance performances were quite run of the mill and we decided to leave them midway and go onto the deck.I loved the sights from the top of our cruise ship under the moon light.It was a surreal and exhilarating experience -the shore dotted by lights and the moonlit sky with our ship cruising gently along.In fact we even did a bit of yodelling ! They have various cruises to suit every pocket from the super luxurious cruises (per head Rs 5000 plus) that have unlimited food, entertainment and casinos to the more pocket friendly short trip ones which give you a short one hour cruise in as little as Rs 300 per head (food and drink extra). Goa is considered the Las Vegas of India due to its teeming Casinos and nightlife.There are lot of casinos that offer you a chance to romance Lady Luck and change your fortunes by a roll of the dice or Poker or whatever is your favourite game of luck . 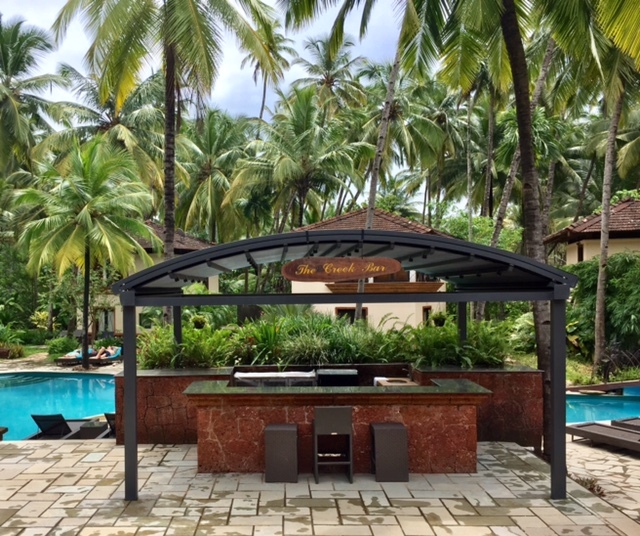 Once again,Goa has some splendid Casinos housed in Five star hotels like the Casino in JW Mariott, Panjim, the famous Deltin Royale Casino which is located at Noah's Ark, Panjim, Casino Dunes – another popular option located at the Zuri White Sands resort. 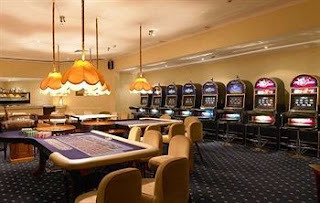 We went to Casino Pride which is located at River Mandovi because it was near our cruise. The entry fee to the casino from Monday to Thursday is Rs 1,500 and one-time Play Coupon worth Rs 1,000. 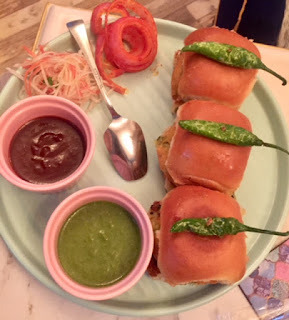 From Friday to Sunday the entree fees goes up to Rs 2,000 though . This is inclusive of unlimited drinks while playing at the gaming tables.It is quite fun and addictive though I did not play myself . Goa is considered the Las Vegas of India for its booming nightlife and houses some very happening clubs that are very popular for their nightlife ,music and ambience . 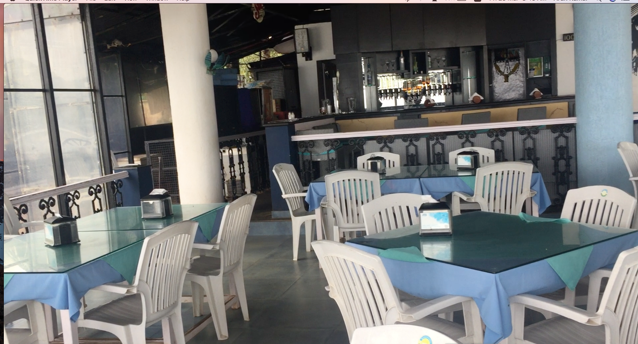 Most of the Famous and must visit clubs are situated towrds North Goa like Club LPK (Love Passion Karma at Candolim Beach),Club Mambo’s (at Calangute Beach),Sinq Beach Club (Calangute ),Tito’s (at Baga Beach ), Nyex Beach Club (at Anjuna Beach). I visited Tito’s and though the food and drinks and ambience were quite good , I did not find the discotheque any better than the regular ones .We were lucky to be there on a Saturday Night which happened to be ladies night and got us free entry and free cocktails . We ended up having dinner there and I must say that the food and wine served were quite good . It gets quite crowded in the tourist season so I would recommend getting entree tickets online before hand to avoid disappointment later . Of late Goa has been hosting some great water and adventure sports including parasailing and whitewater rafting . 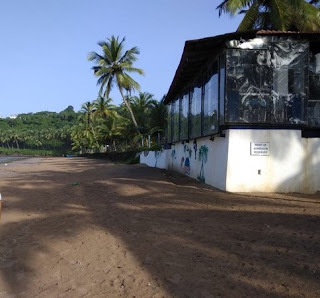 Parasailing -Dona Paula, Majorda,Oberoi Beach resorts and Anjuna, Bogmalo, Calangute, Colva, Candolim and Vagator beaches provide the facility for the Parasailing . Jet Skiing -You can be enjoy Jet skiing at many beaches in Goa such as Aguada Beach, Colva Beach, Candolim Beach, Calangute Beach, Miramar Beach, Benaulim Beach etc. They are capable of reaching very high speeds and thus one is advised to go along with an instructor if trying it for the first time. 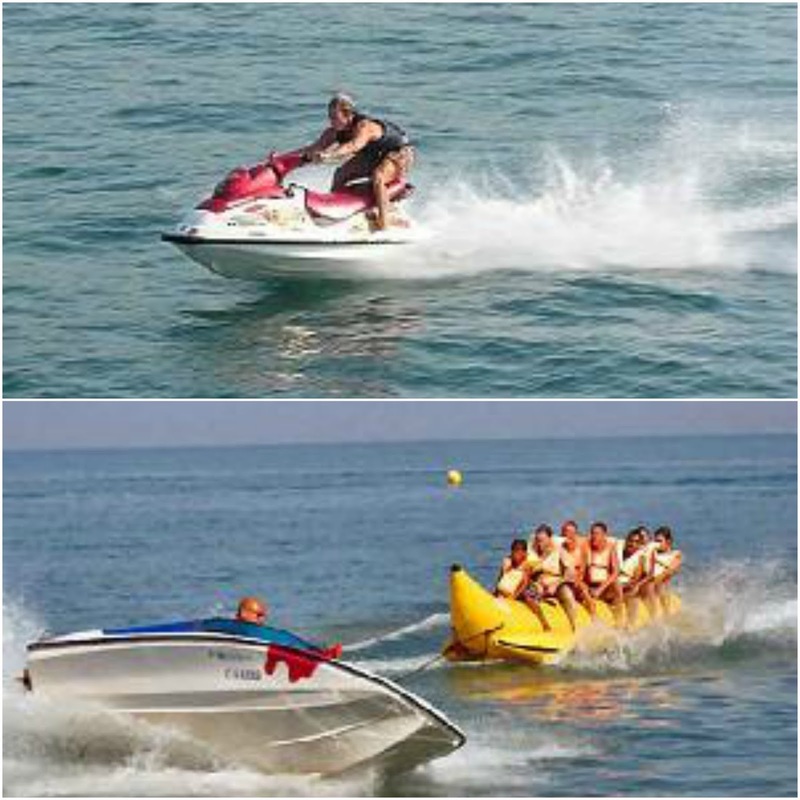 Banana Boat Ride - The banana boat can accommodate up to 6 adults and life jackets are provided for your comfort and safety. The banana boat ride is really an enthralling activity where one needs to sit on a boat which is molded to take the shape of a banana and can accommodate six people in one ride. The thrill of the ride starts when the boat rolls and pitches over the undulating waves of the sea. One receives a flip after each and every ride which adds another dimension of enticement for those riders who have taken the ride for the first time. Each and every banana boat is accompanied by lifeguards. River rafting or whitewater rafting is also an adventure sport available at Madhaei River and Mandovi river among others .You can enjoy these sports during monsoons too . Other than seashells and products made from seashells , you can find lots of funky and cheap clothes and junk jewellery here. The place is famous for its Feni (a local alcoholic drink ) - The cashew Feni is much more stronger and has a very sharp taste and smell , the coconut Feni has a milder smell but both are very potent.Besides Feni,Goa is famous for its cashew nuts and you can get all sorts from salted, sweet to unpeeled ones . I took some cashews and some sea shell key chains to gift . I missed The Dudhsagar Falls, The Aguada Fort and The Mario Museum on this visit but I am planning to go back and visit these soon . 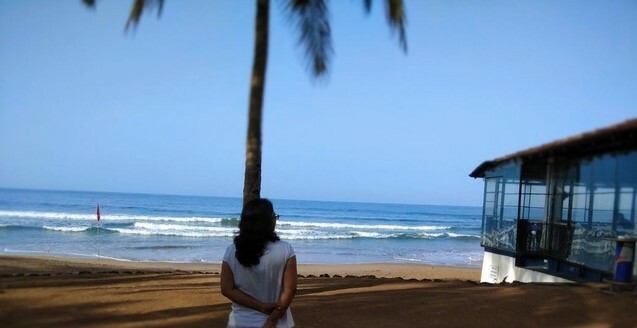 Till then - I shall miss you Goa ! Thank you UK ! But I think you are having best of both worlds then -friends and a great place to relax. Goa is my favorite Destination so far. This blog has an amazing information about the destination of every travel place you have visited. Goa Is My Dream PLace Where I want to go once in my life, I really glad to see these all wonderful photographs of Goa. Thanks for sharing these all memories of Goa Trip. AN amazing destination to visit in summer weather, i am also planning to go for Goa tour. i have heard about goa many type finally i am going there. I have heard many positive words regarding Goa such a beautiful place and you shared good information about that place. Its really enjoyable and stunning photos you shared. Go Sauch a beautiful place and you shared good information about that place. Its really enjoyable and stunning photos you shared. 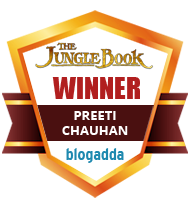 Hey thank you buddy, this is very good blog with nice information and images which you had been posted is also very attractive. I feel this very effective post and tourist must read it. 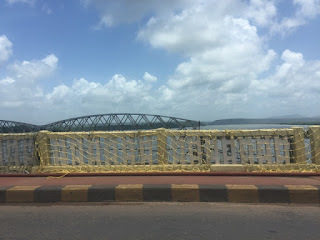 Goa such a beautiful place and you shared good information about that place. Its really enjoyable and stunning photos you shared. Thanks for sharing it. 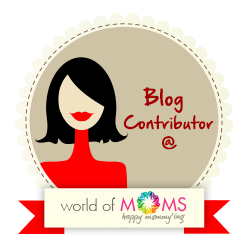 I am really thankful to have the information from this blog. It looks that you had a great time in Goa and you have shared a nice post on your experience. 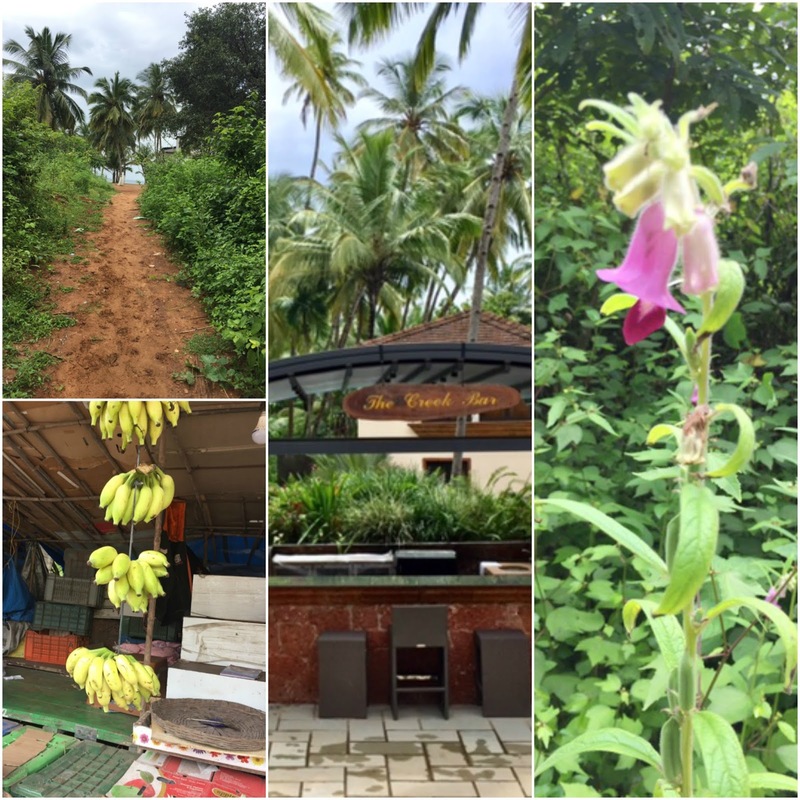 Good post, You shared amazing experience of your Goa trip. Its really enjoyable and Goa is my favorite destination to visit.